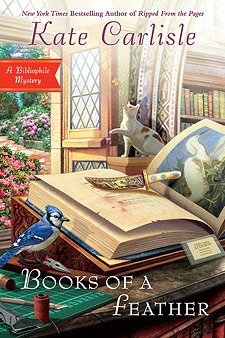 From the New York Times bestselling author of Ripped from the Pages, San Francisco book-restoration expert Brooklyn Wainwright's latest project is for the birds, but it may have her running for her life. . .
Brooklyn's friend Ian runs the Covington Library, which is hosting an exhibit featuring John James Audubon's massive masterpiece, Birds of America, currently on loan from an Arab sheik. During the gala celebrating the book, she is approached by Jared Mulrooney, the president of the National Birdwatchers Society, who urgently needs Brooklyn's skilled hands to repair a less high-profile book of Audubon drawings that's fallen victim to spilled wine. At the same party, Brooklyn is flying high after she's asked to refurbish and appraise a rare copy of Poor Richard's Almanack. But everything runs afoul later that evening when Mulrooney's body is discovered in the library. Rumors fly about a motive for murder. Perhaps Mulrooney wanted to sink his claws into the pricey Audubon book, but Brooklyn believes the man died fighting off a daring thief. Five Stars. "Every aspect of this novel comes together perfectly, from the plot, descriptions of bookbinding and the various books restored, the bad guys/ gals, LOL humor, and likable, folks next door characters…This is not one to be missed!" "Fast-paced and filled with intrigue."